‘Nation Europe’ is based on the rejection of a multi-cultural society of a kind which the right-wing extremists still particularly identify with the USA. 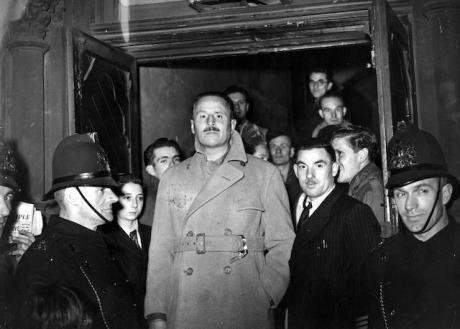 Oswald Mosley after speaking in public for the first time since the war, London, November 1947.PA/Press Association. All rights reserved. Already in the immediate aftermath of WWII, right-wing intellectuals attempted to reconstruct a völkisch Europe idea by falling back on (pre)fascist ideologies, crude “racist doctrine” and National Socialist propaganda. The right-wing ideology of a “Nation Europe”, which was to develop into the third superpower, was first raised by the British fascist leader Sir Oswald Mosley, who already began to attempt to reorganise a brown international movement at the end of the 1940s. The strategic reference to Europe in right-wing projects also mirrored the Nazi propaganda of the Waffen-SS as a “protagonist” for a “united Europe”. In 1951, the former SS-Sturmbannführer Arthur Erhardt established a magazine with the programmatic title Nation Europe (later: Nation & Europe). In his “political testament”, Erhardt explained that a “European major nation” centred around the natural leading power Germany – necessary because of a “far-reaching similarity in the essence of our Völker on bloodlines” – had been baptised in blood in 1945 in the fight by the “European comrades, the French legion in the battle for Berlin, and the Nordic, Flemish, East European SS comrades on all fronts”. A militant position was adopted here right from the beginning against the two superpowers the USA and the USSR. However, with the East European transformation, this contradiction moved into the background in 1989/90. This “European major nation” was now to rise up with a new sense of awareness, and after real socialism, must now also free itself from US hegemony: “The time is ripe for a fundamental reorientation of European Völker – away from regionally-foreign, pan-state global policemen, to a new supra-regional continental unit, which finally gives priority to European interests, and lifts up Europe again to the status of a major sovereign power.” (Karl Richter). The spiritual authorship of demands of this kind was and is evident: back in 1939 Carl Schmitt had already formulated a Völkerrechtliche Großraumordnung mit Interventionsverbot für raumfremde Mächte: ein Beitrag zu Reichsbegriff im Völkerrecht as the geopolitical doctrine of National Socialism – which in terms of power politics, was primarily directed against American influence on the continent. The national peculiarities which have repeatedly caused the extreme right to agitate against the European Union (EU) as an institution, and against the Euro as a common currency, and which have led even up to the present day to successes in most European countries – particularly for populist right-wing extremists – have nevertheless so far hindered the development of institutionalised co-operation beyond national borders, or even the establishment of a pan-European far-right party. In addition to the personal vanities of the leaders in each case, this long-term co-operation also foundered on the different strategies with respect to the intended means of gaining political power, as was also shown by the politics put into practise by right-wing parties in the European Parliament. A certain exception with respect to the partial long-term creation of pan-national structures is only seen on the part of militant neonazism, which sticks to its original concept of a “white race”, and opposes the “common enemy of all Völker”: “international big business”. Right-wing extremists oppose the EU as an “American” form of integration, and counterpose it with their “Europe of the regions” or a “Europe of the Völker” and/or “Volksgruppen”. Regionalism as an ethnicising common ideology aims to replace (state) nationalism, and internally shape and structure the “Nation Europe” to be created. National-revolutionary ideologies oppose the EU with an indirect cosiness as a “vomit-inducing mishmash” and “McDonalds paradise” (Günther Nenning). The ideological workshop of the FPÖ states: “The Europe of the regions stands for roots in the homeland”. (Jürgen Hatzenbichler). This was not the case in a “pseudo national state”, which failed to “unite all members of a Volk within a state” (Hatzenbichler). The aim is to replace a pluralist political system with an authoritarian system which is to be based on an organic ideas of ethnic nationalism (Volkstumsvorstellungen). As a consequence, the freedom of the individual should be subordinated to the omnipotence of a European Reich (quasi as a “völkisch-regional antinational state”) as a consequence of the unconditional privileged status of the notions of unity, order and society. The “Nation Europe” as a central motif of far-right European ideology, formulates a claim to unrestricted dominion of the most omnipotent possible power, which is seen in political and military confrontation with American hegemony. At the same time, however, this also formulates a projection surface which is based on the rejection of a multi-cultural society of a kind which the right-wing extremists still particularly identify with the USA. The projection surface here is formed in a unifying way by the shared bogymen: the USA and the “globalisers” on the American “East coast” (an antisemitic code used ubiquitously in right-wing extremist circles). A Europe of small (völkisch) units and regions – as emphasised by the Italian Lega Nord for instance – has priority over a “Europe of high finance, profit-oriented industry, banks and major companies”.